Adopted on March 9, 1885, this North Carolina state flag has been waved proudly by natives for over a century. Paying respect to the United States national colors, this flag features red, white, and blue stripes. 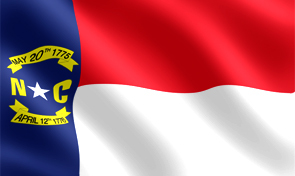 The NC stand for North Carolina, and the five pointed star represents the status as a state. As one of the 13 original colonies, North Carolina became a state in 1789, and the dates shown on the scrolls represent prior dates of the Mecklenburg Declaration of Independence and the Halifax Resolves.